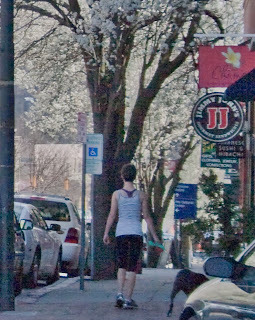 An abundance of flora and fauna herald the arrival of spring to the Asheville area. Among the first to bloom are cherries, dogwoods, and common daffodils closely followed by wild irises, and native trillium. Hiking in the Western North Carolina mountains is always a treat, and this time of year promises to infuse the body, mind and spirit with the fragrance of abundant life unfolding. Even in the city, find the Asheville Botanical Gardens on W.T.Weaver Blvd. near UNCA to be filled with carefully maintained native plant guilds. This time of year you might find 3 or 4 different kinds of trillium in bloom. even more traditional fare is offered with options to delight the diner with specific requirements. Asheville. For a more theatrical experience, The Montford Park Players whose season begins April 12th with "As You Like It". Of course Asheville has venues where you can satisfy your social, culinary and entertainment goals in one stop. Many of our local pubs and eateries feature live music on select evenings. Catch a movie with locally brewed beer and pizza at Asheville Pizza and Brewing Company, or catch "Singers, Songwriters in the Round" on Tuesday April 3rd from 7-9pm. at Jack of the Wood. They feature some of the areas most famous micro-brews plus some of the best bar food you will find anywhere. Check out their schedule for more showtimes. At Asheville Connections we specialize in helping people to have a truly memorable vacation in the Western North Carolina mountains.